Located at the private marina belonging to the luxurious Four Seasons Hotel Doha, is the world’s largest Nobu. At a whopping 26,000 square feet it is a stunning seashell shaped restaurant with a gorgeous roof terrace. It is a work in art in itself and an architectural wonder. I dined there during my press trip to Qatar and it was definitely one of the best Nobu experiences I have had to date, as well as an amazing Japanese Tasting Menus. It is set over three floors and has phenomenal panoramic views of the Arabian gulf. It is definitely a Nobu that Nobuyuki “Nobu” Matsuhisa can be proud of. The dining room itself is elegant with modern decor and spacious. We had a lovely round table for the evening, but there was also a Sushi bar where you could watch the chefs at play whilst you dined. The evening was particularly special for me as it was the first time I was meeting my fellow blogger friend Polly from Follow Your Sunshine for the first time in person. Polly lives in Qatar and over the years we have gotten to know each other over the blogosphere and so it was so lovely to put a face to the name! We kicked off the evening with some cocktails and I decided to try the Japanese Mojito, which was a blend of vodka, sake, fresh green apple juice, muddled lemongrass, fresh lime, shiso leaf and a splash of ginger ale. It was really refreshing and delicious. Then began our Omakase Tasting Menu experience kicking off with King Crab in a sesame sauce for me due to my dietary requirements, whilst the others had Chu-Toro Sashimi with Negi Goma Jalapeno Jelly Caviar. Next up was Sashimi 4 ways and my selection was Octopus Tiradito, King crab Jalapeno, Salmon and Omelette. I especially loved the Octopus and the heat kick it had. We were told to eat each plate one by one rather than mixing and matching, and this definitely played an important part in the different flavours we experienced from each dish. The third course was Lobster Kohlrabi and Dry Miso, which was one of my favourite dishes of the evening. I just love lobster. It is my favourite seafood and this was particularly pleasing. Next up we experienced a gorgeous sushi selection which included Eel, Shrimp and Octopus for me. We were told the do’s and don’ts of eating sushi and told that we must never mix the ginger with the sushi and instead should be eaten in between each sushi. A dreamy King Crab in Miso butter was served up next and it was sublime. My mouth is watering thinking of it. It had so many different textures and flavours that it was a real delight to the senses. Our final dish of the evening was the most fun as it involved us cooking it ourselves on the table! It was a Omi Beef Ishiyaki and we were given slices of beef, seasoning and a hot sizzling plate and so took each piece in turn and cooked it to our liking and then devoured it with an array of different sauces. It was definitely a highlight of the meal and everyone on our table thoroughly enjoyed the interactive nature of the dish. On to the sweet course, we were presented with massive platters bearing Seasonal exotic fresh fruit, sorbet and ice cream and thoroughly enjoyed these. The Blood Orange Lollipop was a real treat as I love Blood Orange but always struggle to find them. The Frozen Chocolate Mousse was just heaven in a bowl. Crumbly chocolate, crunchy honeycomb and ice cold chocolate cream all just led to squeals of delight across the table as everyone tucked in with glee. It was served in a stunning marble bowl and just was the most sensational end to a fantastic meal. After our meal we went out to the roof terrace where we enjoyed some iced Sake, which was absolutely delicious. 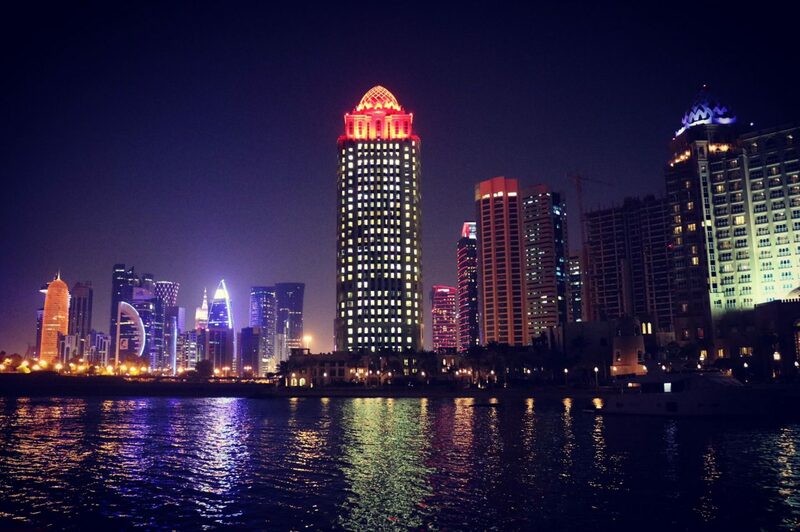 The views from the terrace were stunning as you could see the Doha skyscrapers all lit up and twinkling in the night sky. I had a wonderful experience and highly recommend Nobu Doha to anyone visiting Qatar, as it is an experience that was just incredible, especially if you love Japanese food. For more information about Nobu Doha visit their website here. For more information about Four Seasons Doha, visit their website here. To read more about my trip to Qatar, click here. My meal was complimentary as part of my Press Trip to Qatar but all views and photos are my own. Loved reliving this incredible meal that I had with you through your amazing descriptions and pictures. So glad we finally got to meet, and what a setting for it!! Hope to see you again soon my love. So so jealous of everything about this!! This is making me so, so hungry! What a fantastic meal! The resturant looks incredable too!